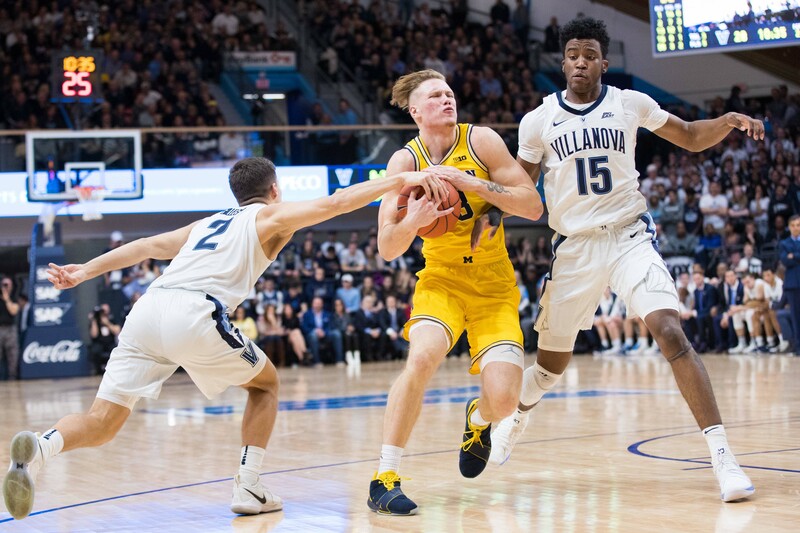 Home Big Ten University Michigan Dismantles Villanova… Are Wolverines Being Slept On? Michigan Dismantles Villanova… Are Wolverines Being Slept On? Michigan defeated defending champions Villanova by a scoreline of 73-46. That’s not an error, but something that actually happened yesterday as Villanova went down in their worst loss in recent memory, and Michigan picked up a “signature” win in only their third game of the season. The Wildcats were ranked a full ten spots higher than Michigan, at #18, but that didn’t make any difference in the final scoreline. The game wasn’t close from the beginning and Michigan went into the half with a 44-17 lead. They did especially well on turnovers and outscored Villanova in that department by a margin of 25-1. It was a dominant performance against a top ten opponent, and it could definitely be a turning point for Michigan. After all, Villanova was the team that beat Michigan in the title game back in April. Before that, Michigan was hardly expected to make it into the tournament at all, at one point. They definitely weren’t expected to make it as far as they did and their ranking near the lower part of the top 20 shows that the media didn’t put too much faith in them compared to other teams who received higher ranks. A win like this shows that maybe Michigan is better than their rank says. Maybe they were slept on during the preseason. It’s somewhat surprising in a way that they’re taking a step forward right now, because their lineup looks different than it did last year. There’s no Mo Wagner, no Muhammad Ali Abdur-Rahkman, no Duncan Robinson. The former went to the NBA early, with the latter two graduating. But senior guard Charles Matthews has stepped it up as a leader with 20 points against Holy Cross and 19 against Villanova. Perhaps more unexpected is the 18 points from freshman forward Ignas Brazdeikis, who has an early average of 16.3 points per game through the first three games of the season. Michigan was known last year as a team that could get hot and go on runs, and it was one of the things that helped them make it as far as they did. But against Villanova, they did more than shoot the ball well and they added a stronger performance in the paint, both on the offensive end and the defensive end. It looks like Brazdeikis might add more to the Wolverines offense and defense immediately than some projected. There were times where he proved to be an influence in shutting down Villanova’s offense, and on the other end, he showed that he can finish second in scoring for the game while mostly playing in the post. Is Michigan underrated? They very well might be. They fared better in their matchup with a top ten team than their rivals from across the state did at the beginning of the season, although it’s important to note that Villanova is ranked #8 and Kansas was ranked #1 when Michigan State faced them. Michigan’s work in out of conference play isn’t done, however, until they take on #7 North Carolina on November 28th. It’s their last non-conference game before they have to take on a Carsen Edwards led Purdue team on December 1st, and when that game comes, we’ll see if they can repeat their performance against a top ten team. Can (And Should) The New York Giants Move For Jameis Winston?